The Michigan Department of Agriculture and Rural Development (MDARD) reported that boxwood blight was detected for the first time in Michigan. Three separate locations in Oakland County located the disease, including a landscape firm, a homeowner’s yard and in holiday wreaths being sold at a retail store. The Wisconsin Department of Agriculture, Trade and Consumer Protection (DATCP) also alerted MDARD that infected boxwood may have been sold at other retail locations in Michigan. Not six months ago, in July 2018, boxwood blight was reported for the first time in Wisconsin. The disease was found at a nursery during a routine annual inspection, according to DATCP. 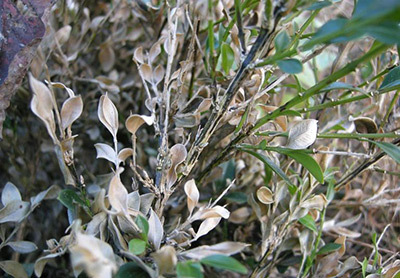 Boxwood blight is a fungal disease that causes boxwood leaves to yellow and drop, eventually leading to the weakening and eventual death of the plant from secondary diseases, according to Gregg Robertson, a government relations consultant for the Pennsylvania Landscape & Nursery Association. The disease was first discovered in the United States in 2011, and has now spread to 24 states, according to the report from MDARD. Anyone with suspected cases of plants infected with boxwood blight should contact their local extension office. Buy boxwood plants from reputable suppliers and carefully inspect them. If possible, purchase plants produced under the Boxwood Cleanliness Program. Buy less susceptible boxwood varieties. Refer to the list developed by North Carolina State University. Do not use boxwood holiday decorations near boxwood in a landscape. Read more: Will compost be the end of boxwoods?